Derek Mackay is facing a crunch vote on his Scottish Budget proposals on Thursday. 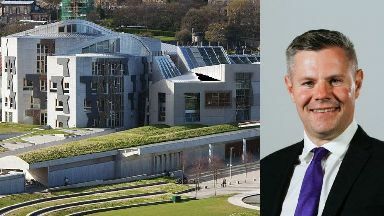 Scotland's finance secretary has said he is "open to compromise" as he tries to strike a deal to allow his tax and spending plans for the next year to pass at Holyrood. Derek Mackay is facing a crunch vote on his Scottish Budget proposals, with all the opposition parties having previously indicated they cannot support the package. Labour have urged the other parties to join with them and "vote down" what they branded a "cuts budget". Mr Mackay said the "ongoing uncertainty" caused by Brexit meant "there has never been more need for MSPs, of all parties, to act responsibly and not add to that uncertainty". With the SNP not having a majority in the Scottish Parliament, the finance secretary has to convince at least one of the four rival parties there to back him. Speaking ahead of Thursday's crunch Holyrood vote, Mr Mackay said: "Our spending plans for the coming year contain additional money for schools and hospitals, protecting vital public services and investing in our economy, while also providing stability amid the ongoing uncertainty caused by Brexit. "With that backdrop in mind, there has never been more need for MSPs, of all parties, to act responsibly and not add to that uncertainty. "So I urge all MSPs to unite behind the 2019-20 Scottish budget - that is what people the length and breadth of Scotland expect." The Finance Secretary insisted the Scottish Government was "investing in essential public services, particularly the NHS" at the same time as ensuring 55% of income taxpayers in Scotland pay less than they would if they were living elsewhere in the UK. "Taken together with the personal allowance, 99% of taxpayers will pay less income tax next year on the same income," Mr Mackay added. He stressed: "Since introducing the Budget Bill, I have sought to engage with all parties in order to secure support for our spending plans. "We are open to compromise in order to ensure we deliver the budget that the country expects and I am confident others will approach things in the same spirit." The Scottish Greens, who supported his budget in the previous two years, said at the weekend they could not do so this time round without changes being made, claiming the current proposals were too "damaging" for local services. 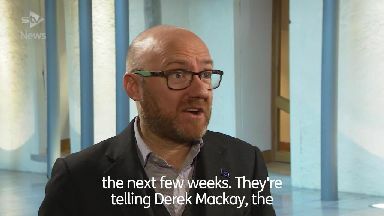 Patrick Harvie, Scottish Green co-convener, later indicated he could still do a deal if Mr Mackay was "willing to give ground". He tweeted: "It's disappointing that we still don't have a fair compromise from the Government. "But if @DerekMackaySNP is still willing to give ground, we are still focused on achieving what's needed for Scotland's local services, the people who deliver them and those who rely on them." Labour Holyrood finance spokesman James Kelly said the budget needs major alterations. He said: "Derek Mackay has produced a cuts budget - £319m worth of cuts in funding for local government and cuts in tax for high earners. "No credible anti-austerity party would ever propose it and all credible anti-austerity parties should vote against it. "The budget needs a fundamental rewrite, not more tinkering around the edges. "That's why opposition parties should vote down the budget and tell Derek Mackay to come up with a better plan, like a 50p top rate of tax so that the richest pay their fair share." The tax and spending package currently before MSPs includes an additional £730m investment in health services in Scotland and £180m aimed at boosting attainment in schools. It also outlines #5 billion of capital investment, including £1.7bn spending on transport infrastructure and a #50 million town centre fund to support struggling high streets. Meanwhile, tax changes proposed in the budget will increase differences between Scotland and the rest of the UK. From April, taxpayers south of the border will only pay income tax at the 40p rate if they earn more than £50,000 a year - while in Scotland it is proposed people will pay the higher rate of 41p on earnings above £43,430.